"You’re buying trouble if you buy a fake!" This may be the most important page on the website. If you don't want to read the whole page, please at least scroll down and read our tips on avoiding fakes if you are thinking of buying either new or secondhand. 1.. You can't identify a fake just by looking at a photo. 2.. (Mythbuster) All fakes have holograms, serial numbers and date codes - their presence proves nothing. 3.. (Mythbuster) You cannot verify serial numbers and/or date codes on the official GHD website. 4.. Buy from a reputable GHD seller who will want to protect their high and valuable feedback rating by selling only genuine items. Unfortunately, fake GHD’s (both new and second-hand) are commonplace. Apart from the fact that they are illegal, if you buy one, you’ll find there’s no guarantee, and you may not be able to get them repaired when they break down – which they will! 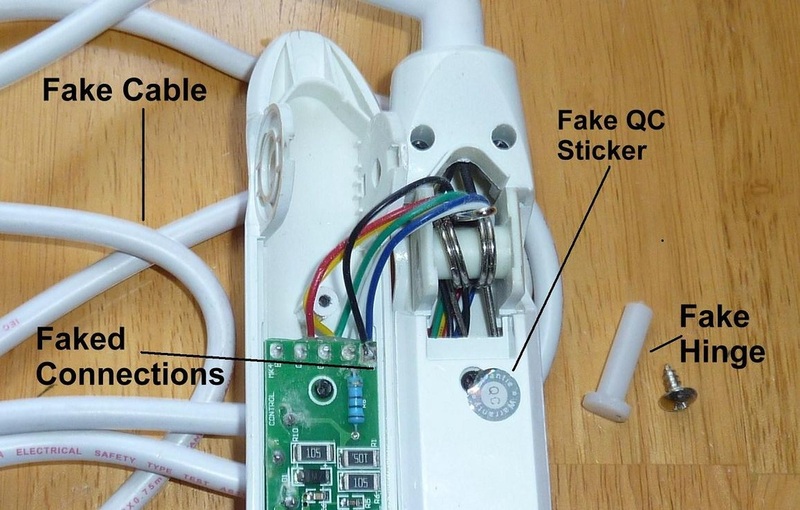 There are numerous different types of fake, and there are no wiring plans or spare parts available. Your fake will have no value to resell or trade-in, and it may even be dangerous. Please read on for the full facts, and how to avoid buying a fake. Cable: All genuine GHD cables have a flattened oval profile. If it has a round profile, it’s most likely fake. Hinge Pin / Screws: All genuine hinges are brass with large steel screws on either side. You can’t see the brass without disassembling, but the side screws are visible if you prise off (carefully) the caps on either side. Fakes usually have a steel or plastic pin with a small screw on one side, and a flat “plate” on the other. Quality Control Sticker: Genuine GHD’s do not have quality control stickers on them. Fakes often have them on the inside of one of the arms. Electrical Connections: All genuine GHD models have screwed on electrical connections. Fakes are usually soldered. Known Fake Serial Numbers: The following serial numbers are known to be fake – but be careful – there will be many others also. Boxes, Booklets & DVD's: Don't assume that a GHD is genuine just because it's well packaged. Very attractive but fake packaging is the norm. Buy only from an approved stockist. GHD say that you can confirm if a stockist is authorised on their website, but their online system appears to be inaccurate – so you will need to use your own judgment in many cases. Many, but not all, advertisers on sites like Adverts, Done Deal, Ebay, etc. sell fakes. Make searching enquiries before buying from any of these. Ask if they are approved stockists, and for proof that their GHDs are not fake. Do not buy from any non GHD owned website unless you are 100% certain it's accredited and legitimate. Check out the prices on a website you know to be legitimate (example: http://www.petermark.ie/). If your seller’s prices are significantly lower, we recommend caution. At the very minimum, make sure you will get a receipt, and that the seller has an established address where you can return the item if there’s a problem. This definitely rules out buying from people in pubs, car boot sales, markets, etc. Even the latest models have been faked. There are genuine bargains to be had on the likes of Adverts, Done Deal, Ebay, etc., but they are all also rife with fakes. Exercise caution. Many people genuinely don’t know the item they are selling is fake, so be polite, and maybe even sympathetic, if appropriate. Ask the seller to show you the original receipt. If they haven’t got a receipt (many people don’t keep them), ask where it was purchased. If they can’t remember, or say they got it as a present – be very careful indeed! Don’t buy from car-boots, markets, pubs, etc. Carefully prise off the end caps to see if there are genuine GHD screws on both sides. Use a finger nail, nail file or small screwdriver, push it in behind the cap from the front, and twist. Be careful because they break easily and they can fly away. Know that all fakes have holograms, serial numbers and date codes - their presence proves nothing. Genuine GHD’s prior to Model 3.1 did not have holograms. We haven’t seen any fakes of models prior to Model 3.1, so you should be fairly safe with the earlier ones. Colours: We have seen some black fakes (especially the glossy ones), but fakers tend to go for the colourful and special editions. The majority of model 4.1’s in circulation are fake. Probably between a third and a half of the other models are fake. If you want to be safe, only buy from an established dealer / repairer who guarantees the authenticity of the GHD, and who has built up great feedback, and who therefore has a valuable reputation to protect. You might get one cheaper from a private seller, but you won't get certainty that it's genuine, nor will you get a guarantee. Can you identify any fakes in these photos? Well, you’re a genius if you can! The answer is at the bottom of the page. We do not sell fakes – ever. We do not buy fakes – ever. We do not accept fakes as trade-ins – ever. Even though we do not buy or sell fakes, we will do our best to help you with a repair if you have been unlucky enough to have bought one inadvertantly. We may be able to fix loose plates, broken arms or damaged cables, but will not undertake any electrical work on them. There is no warranty on repairs to fakes as they are totally unpredictable. Copyright: All text, photos and other content of this article is original, and copyright is asserted. No part of the article may be reproduced without specific written permission of the author. Permission will generally be granted at no cost subject to certain conditions.